Beginner classes introduce proper alignment of poses, breathing techniques and the skillful use of props. Beginner classes teach modifications and do not explore advanced physical postures. These classes are designed for students who are brand new to yoga but are also appropriate for the seasoned practitioner. Basics classes emphasize proper alignment, breathing and the use of props. These classes keep sequences and flows very simple to create a safe and empowering experence. Basics classes are designed for students who are looking for easier poses and simple sequences. Level 1 classes, like Basics or Beginner classes, explore proper alignment and breathing and do not feature advanced physical poses (or if they do, pose modifications are taught). Depending on the studio, level 1 classes may or may not assume some knowledge and experience of yoga. Level 2 classes assume that the practitioner has some yoga knowledge and experience. Level 2 classes introduce advanced poses and sequences which require more strength, stamina, flexibility, and balance than Level 1 classes. Level 3 classes are for advanced practitioners. Level 3 classes have the highest degree of difficulty and require deep knowledge of proper alignment and a high level of physical strength, flexibility and stamina. Gentle yoga classes are slow-placed, nurturing and supportive classes that are appropriate for all practitioners looking for a relaxing and stress-reducing experience. Gentle classes are appropriate for individuals with mobility limitations, chronic conditions, musculoskeletal issues and other conditions. Meditation classes are typically performed while seated in a cross-legged position, although meditation can be done while walking and performing other activities. Yoga classes incorporate meditation within the physical postures or as a unique component of the class. Meditation is a process of awareness and self-exploration to create balance of the mind, body and heart. There are a wide variety of meditation styles and philosophy. Pranayama classes are typically performed while seated in a cross-legged position and consist of breathing exercises designed to access the flow of energy (prana) in your body. All yoga classes incorporate varying techniques and degrees of pranayama. Restorative yoga classes use props and hold postures for longer periods of time to create deep relaxation. Pre- and Post-Natal Yoga classes - Click here for more information. There are many other styles of yoga classes, including AcroYoga, Partner yoga, Mommy & Me classes, Kids yoga, and more. 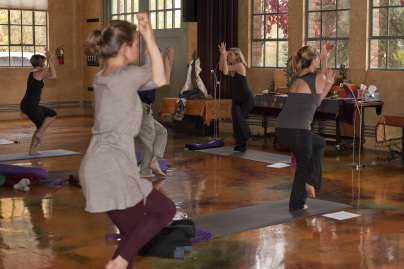 When a class type is not identified, you can assume that it is a multi-level class, although contacting the yoga studio directly is the best way to ensure that the class is right for you. Regardless of which level class you attend, always stay mindful and connected to your body’s needs. Always move into a gentle pose or modify when needed. Balasana (Child’s Pose), Supta Balasana (Supine Child’s Pose), Sukhasana (Easy Seated Pose) and Ado Mukha Svanasana (Downward Facing Dog) are great poses when your body needs a rest.